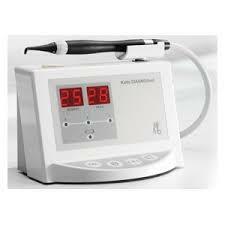 The DIAGNOdent Laser by the Kavo Corporation detects even the smallest cavities at the earliest possible stage. It actually looks beneath the surface of your teeth to detect decay “from the inside”. Early detection allows us to place small microscopic fillings virtually invisible to the naked eye. When this detection system is used, treatment is very quick, painless and in most cases without the need of anesthesia. The Diagnodent is painless, and invaluable in keeping your teeth for a lifetime. If you cannot detect the disease, how can you treat it? Dentists often experience anxiety when attempting to diagnose the phenomenon known as hidden caries. A suspicious-looking tooth presents a treatment dilemma for dentists. Should the tooth be opened up? What if no caries is found? Should the tooth just be watched, or does that give caries more time to destroy the tooth's surface? A changing caries model: due to floridation, caries has gone "underground". While helping to improve the oral health of many Americans, fluoridation has resulted in harder tooth enamel. Incipient caries lesions that once began on the tooth's surface have now migrated below the surface. Proven clinical results: Treatment decisions require a higher degree of certainty. The DIAGNOdent laser caries detection aid removes the doubt from treatment decisions regarding hidden caries ore questionable stained grooves. The device's ability to see into occlusal pits and fissures enables dentists to treat sub-surface caries lesions with confidence. How can Diagnodent® help me? Diagnodent® accurately exposes more caries than X-rays and examinations. In fact, this revolutionary diagnostic tool is over 90% accurate. Sometimes, caries “go underground” due to fluoridation. This essentially means that lesions that once lay on the surface of the tooth bed down, and remain invisible to the naked eye. Because Diagnodent® exposes caries earlier, more treatment options are possible. Allows dentists to perform treatment with greater confidence. Allows for the investigation of suspicious areas. Helps reduce future dental procedures. More accurate than any other diagnostic tool. No need for invasive investigations. What does the Diagnodent® process involve? The Diagnodent® process is performed within the scope of a regular dental checkup. It is strikingly similar to having a laser pointer aimed at the teeth. Diagnodent® is a hi-tech tool, which first scans a clean tooth surface with a laser beam. This scanning procedure serves to calibrate the instrument by providing information about the tooth structure. The Diagnodent® System is actually measuring the amount of laser fluorescence within the tooth. As each tooth is scanned, the amount of reflected laser light is recorded to produce a digital readout. If the tooth contains little or no decay, little or no laser light will be reflected back to the instrument. However, if a tooth contains caries of any significance, more laser light is reflected back. High readings (compared to the tooth originally scanned) indicate that caries are present within the structure of a particular tooth. 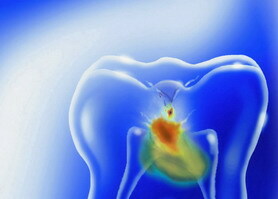 The amount of laser light reflected back correlates with the amount of decay within the tooth. Once we determine which teeth are suffering from decay, a plan can be formulated and treatment options can be discussed. In most cases, the early detection of caries means more treatment options and a greater chance of saving the affected tooth. If you have any questions about Diagnodent®, please contact our office.